Fishing for largemouth bass, channel catfish, blue catfish, black crappie, saugeye, striped bass and white bass at Adobe Creek Reservoir in Colorado. At an elevation of 4,100 feet, this is a warm water lake featuring catfish, bass, crappie and saugeye. 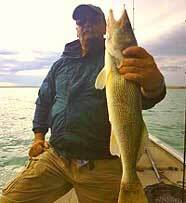 Albert Goode with a nice birthday present - a really nice walleye he caught on a Mister Twister grub. Locally known as Blue Lake, Adobe Creek Reservoir opens one hour before sunrise and closes one hour after sunset. Adobe Creek Reservoir in CO.
Adobe Creek Reservoir, fishing lake in Colorado.